Pre-season training for St George AFC continues every Tuesday and Thursday. All sessions commence at 6.30pm at Olds Park (Forest Rd Peakhurst). New players of all standards & experience levels are welcome to attend. Plus St George will be fielding a women's team in 2019 so all women looking to play AFL are invited to attend pre-season training. St George will be running 3 senior mens teams, 2 U19s teams, a women's team, and a Masters team in season 2019. Round 1 of the 2019 season commences on Saturday 6th April at Olds Park. Practices matches will be held in March on 9th, 16th, and 30th. Details are to be advised shortly. After winning 3 Grand Finals in 2017, many senior players took that opportunity to hang up the boots which meant we were able to give senior football experience to the many outstanding juniors and U19s from our club. This will set the club up for a sustained period of re-building and growth in the coming seasons. Only our Masters team were able to record a Premiership win but our U19s Div 1 team finished 2nd after the home-and-away-season. Congratulations to all players & coaches. St. George AFC receives $300,000 grant from NSW State Government. Mr Mark Coure MP, Member for Oately, has secured $300,000 in funding for St George AFL/AFC to install a watering system, electronic scoreboard and upgrades to the club house at Olds Park. Mr Coure announced the NSW Government’s funding commitment on Saturday evening to applause from players and supporters. “This funding supports St George AFL/AFC to deliver sporting opportunities to local athletes and foster a sense of community amongst spectators and players”, Mr Coure said. The oval at Olds Park is used by a number of sporting clubs and organisations, including St George and Penshurst RSL Panthers, and they will also benefit from this grant. 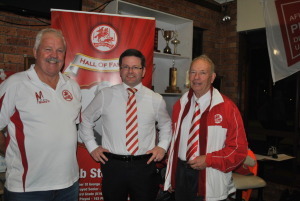 “St George AFL/AFC has a long history in the local area and if the walls in the club house could talk they would tell of wins, near wins, friendship and above all a love of the game that is second to none.” Mr Coure said. “I am very proud to have been able to secure this funding from the Minister for Sports, the Hon Stuart Ayres, in recognition of the hard-work, leadership and vision of the club and look forward to years of competition ahead”, Mr Coure said. Mr Brendan Donohue, President of the St George AFL, is thrilled at Mr Coure’s announcement referring to it as “one of the most significant days for the club, its members and players”. “This funding will allow us to create a safe and fantastic sporting facility that can be used by the whole community. I am delighted and grateful that we are recipients of this grant and thank Mark and the Minister for securing the funding”, Mr Donahue said. “I have a lot of affection for Olds Park and the players that use it and this announcement is on top of funding provided for new goal posts, spectator seating and drainage”, Mr Coure said. Plus any business that you give Blake, returns a fee to St. George AFC. Just let him know that you are from the club. 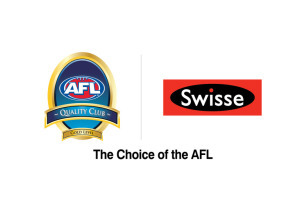 St. George AFC is excited to announce that it has been awarded a Swisse AFL Quality Club. This award recognises St. George AFC as having achieved the highest standards in providing safe, well managed, healthy, and happy environment for the players and spectators. As a Gold Level recipient, this program officially confirms St. George AFC as operating at "A level to recognise exceptional club administration. A community leader." The AFL's General Manager of Game Development Andrew Dillon said: "The AFL is seeking to ensure a quality environment exists within all community football clubs." "We know that community based clubs are passionate about Australian football and we want to ensure that grassroots football is in great shape for now and generations to come." "The Swisse Quality Club Program was developed to assist community football clubs to improve their operations and local environment." St. George AFC is currently one of only two Gold Level clubs in NSW, and the only Sydney AFL club south of the harbour that has achieved this status. Gold is the highest level that can be achieved within this program. St. George AFC wishes to thank all committee members, sponsors, parents, players, and spectators for their support in achieving this award. St. George Masos, 86 Roberts Ave, Mortdale 2232. Dining, entertainment, functions. * Seniors, U19s, Women's, & Masters - Every Tuesday & Thursday at Olds Park at 6.30pm. * 9th, 16th, & 30th March 2019 - Details to be confirmed. * Saturday 6th April 2019 - All St George teams are playing away.